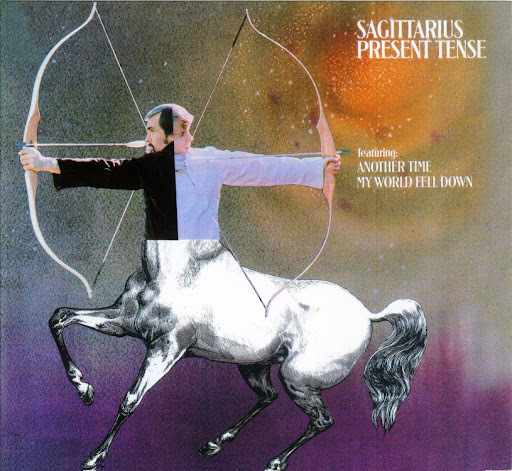 Sagittarius were a studio group created by producer, Gary Usher (who had earlier produced albums by The Byrds, Gene Clarke, Chad & Jeremy, The Millennium and The Peanut Butter Conspiracy). Curt Boettcher helped with the arrangements and Terry Melcher was also involved in the projects. Both albums were of particular interest for their high degree of orchestration and polish. In this respect, they were ahead of their times. Glen Campbell and Bruce Johnston (later of The Beach Boys) were involved in the first single, My World Fell Down, which came from a bunch of John Carter demos intended for Chad & Jeremy, who refused to cut the vocal... Usher made the backing track a bit freakier (i.e. adding more stops and starts, using The Firesign Theatre) and recorded it himself. Glen Campbell sings lead on the recording with Bruce Johnston and Terry Melcher providing backing. It's possible that Chuck Girard and some other Beach Boys etc. are in there too, although only Bruce and Glen are on the contract card for the session. My World Fell Down received considerable airplay in New York, although it failed to make the Top 40. It can also be found on the original Nuggets compilation, and it's expanded Nuggets 4-CD counterpart. Their second 45 Hotel Indiscreet was arranged by Boettcher for outrageous multipart vocals and also features the writers Jim Griffin, (later in Bread), Michael Z. Gordon and The Firesign Theatre... Another couple of tracks on the first album feature these kind of combinations, featuring the nascent Millennium and such unlikely figures as Angelo Badalamente (of "Twin Peaks" fame) as players and writers... the remainder being basically a combination of unused Ballroom tracks, and new songs which were worked up for the Millennium and consequently bumped up to "Grandiose Stereo" mixes. The singles are entirely and radically different versions to the album ones... with the first two minus the 'sound collages' in their album form. The second album was recorded on Usher's own Together label and contained some beautiful love songs such as Will You Ever See Me, I Still Can See Your Face and I See In You. More coherent in theme though not as immediate as the first, ecology and religion/philosopphy are to the fore, as they were in Ushers next project, Celestium, which carried the sound and themes of Blue Marble into a more somber, almost Krautrock vein.. kind of like Gary Usher meets Bowie's Low!